It doesn't seem as though I can see the the card Sylvie, just a close up! This bit looks good though! 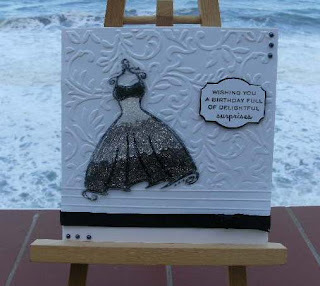 Fabulous card Sylvie, but missing your usual background of the sea !! What a fabulous card I really love it you are so good at this challenge! Gorgeous sparkly dress and a fab idea too. Beautiful dress and can really imagine how lovely and sparkly it looks in the flesh. Fab card. I can see all of the card and the sea ! Both are gorgeous, what a stylish card and i love that stamp perfect. Your life doesn't sound bad either! my first attempt this week with less is more and look forward to seeing more of your beautiful creations. Such a beautiful card Sylvie and well done you on making it so beautiful on acetate. Im too scared to try acetate! Sounds like youve had a great weekend until you came to Mr Blogger! Know what its like, me too! Well done Sylvie. I love how the dress turned out. Another great card Sylvie . we've had your lovely weather this week - sunny and bright! Oh this is fabulous Sylvie, love the dress and what brilliant use of acetate. A really gorgeous make. I think lots of people have been dreaming acetate the last couple of day LOL!!! I was pleased to hear you sold some of your cards. It always feels good to do that doesn't it. Your shopping trip sounds good! Well done on the card sales, seems LIM is popular! Hi hunni wow this is such a beautiful card the image is stunning. We all have days like that Sylvie (the bits that went wrong I mean, not popping over to Spain to do the food shopping!) but at least it won't be your turn tomorrow! This is a pretty card with that sparkly dress and the gorgeous embossed card front. So much texture. Beautiful. I'm glad you got sales from your handmade cards. Sylvie...this is just fabulous! So much depth...and I love the sparkle! Such a lovely card, the stamp looks great printed onto acetate. It's a great card Sylvie!! lovely card - love the glitter!